Michael Mastromarino, 44, was arrested nearly two years ago, and this month he plead guilty. 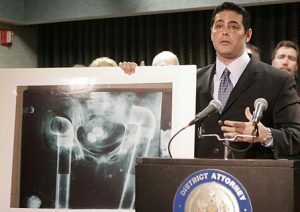 Mastromarino and two of his associates were charged in 2006 with enterprise corruption, body stealing, opening graves, unlawful dissection and forgery. Authorities released photos of exhumed corpses that were boned below the waist. They said the defendants had made a crude attempt to cover their tracks by sewing PVC pipe back into the bodies in time for open-casket wakes. The bodies came from funeral homes in New York, Pennsylvania and New Jersey. BTS shipped the bone, skin and tendons to Regeneration Technologies Inc, LifeCell Corp and Tutogen Medical Inc, all publicly traded companies, along with two non-profits, Lost Mountain Tissue Bank and the Blood and Tissue Centre of Central Texas. Mastromarino plead guilty in March and will be sentenced May 21, to 18 to 54 years in prison.